Opportunity's instruments were able to determine that the rock "Russet" is not a metal meteorite, but a sulfate-rich chunk of Mars cast onto the plains of Meridiani Planum during a past impact. WASHINGTON, D.C. -- A rock that careened through the Martian sky and bounced to a stop on the red planet's surface is most definitely not an alien meteorite, the principal investigator of NASA's Mars rover mission said Friday. Opportunity came upon Russet on the plains of Meridiani Planum while driving towards its current destination Vostok. A small crater nearby hinted that Russet fell from the sky, but whether it was truly alien to Mars - like Opportunity's recent meteorite find Heat Shield Rock - or simply crater ejecta was unknown. 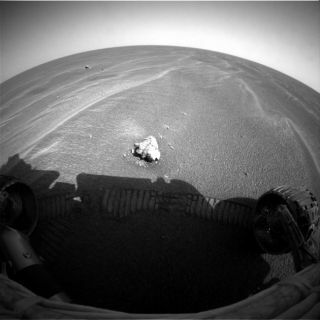 "The [Opportunity] rover found that this was sulfate-rich, and not a meteorite," Squyres told an audience of scientists and reporters here during a plenary lecture at the 2005 meeting of the American Association for the Advancement of Science (AAAS). "So that mystery's solved." But Russet's homely nature does not quell all of the current questions posed by the two Mars rovers. An accidental discovery by Spirit has Mars researchers scratching their heads over an odd patch of soil full of sulfur-rich salts, or sulfates. The rover made the find by chance, when a wheel churned up the bright sulfate material during a failed attempt to climb a Columbia Hill slope at Gusev Crater. "This is a completely serendipitous discovery, a complete surprise," Squyres said during a press briefing earlier Friday. "This is a very rich concentration of salts, and we'll learn more about what it means in the next few days." Squyres said that one possible explanation could be that past water may have percolated up to the surface, bringing up minerals along for the ride, then evaporated, leaving behind a salty crust. But additional measurements using the multiple science instruments attached to Spirit's robot arm should yield a better picture, he added. This week, the Mars rover mission passed the 400-day mark, a far cry from its original three-month plan, and the human strain is showing, Squyres said. "The whole team is deeply fatigued," he said, adding that his best hope at the mission's outset was a 180-day run on Mars. "These vehicles were designed for 90 days of operations." Despite that nominal mission, Squyres had hoped that Spirit and Opportunity would last 180 sols, or Martian days. But with two mission extensions behind them, rover scientists have streamlined how they control Spirit and Opportunity, and now work on a more manageable time schedule that straddles Earth and Mars time. "It's very demanding, it's exciting...it's exhausting," Squyres said of the extended mission. "I think when this is over we're all going to take a very long rest, but for now we have a responsibility to get every bit of science out of these vehicles."